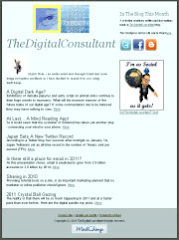 It's that time of year, a chance to look back over the preceding twelve months and review what worked and what did not. And maybe, just maybe, take a sip of Xmas cheer to dull the pain. Twitter has recently released details of its 2011 highlights and once again sports dominates the re-tweets per second ratio. 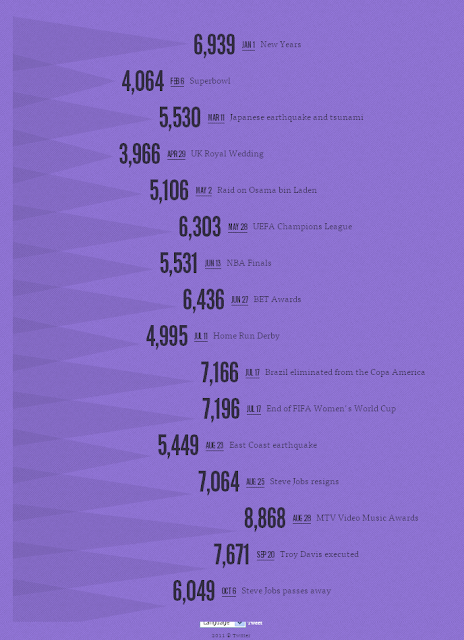 In terms of actual topics, the year was dominated by political upheaval and natural disasters. Cairo, Egypt, Japan, Libya and Tokyo all featured in the top ten cities and countries list. 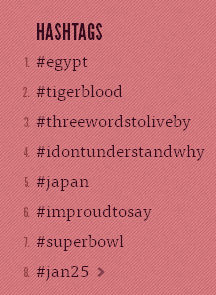 As the Twitter blog states, "from news of Mubarak’s resignation in Egypt to buzz about which McDonald’s restaurants serve McLobster, the top trends that emerged on Twitter in 2011 reflect the diverse things that matter to us in our daily lives. Among other things, we saw history unfold in the Middle East, mourned the passing of Elizabeth Taylor, celebrated National Whipped Cream Day, and cheered for the Dallas Mavericks, Texas Rangers and Wayne Rooney. We wondered about Charlie Sheen, speculated about the Sony NGP, and raved (or raged) about Rebecca Black. And we tYp3ed LyK tHi5." 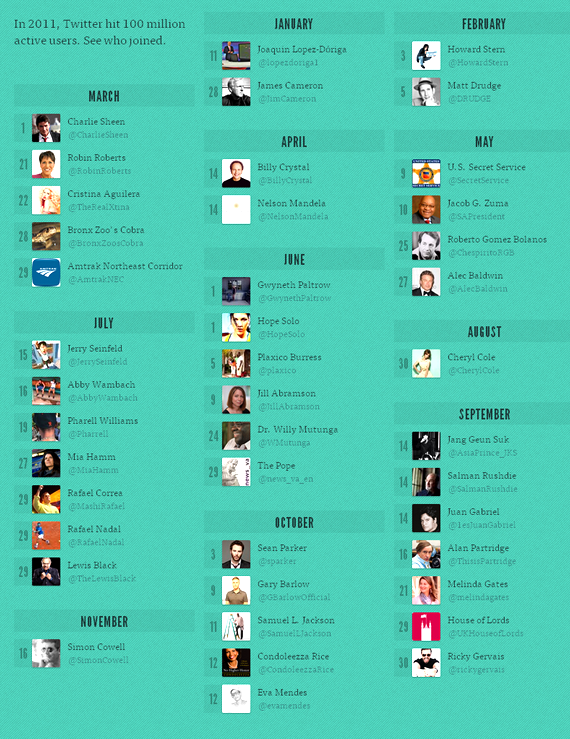 Various luminaries put aside their aversion to social media and signed up to Twitter in 2011. Each no doubt had a different motive for doing so. In its Ten Worst Tweets of 2011 Time ranks the Anthony Weiner on ... Anthony's 'Weiner' as being the biggest faux pas tweet of the year. Comedian and actor Gilbert Gottfried made a complete 'twit' of himself by tweeting 'jokes' about the Japanese earthquake which included tweets such as "Japan is very advanced.They don't go to the beach. The beach comes to them". Not surprisingly he was fired from his role as the voice of the Aflac duck as the manufacturer of said product does 75% of its business in Japan. Don't shoot the messenger or should that be 'elephant? The largest U.S. web domain registry company, GoDaddy, received a massive backlash when its CEO, Bob Parsons, tweeted a link to a video of himself shooting an elephant in Zimbabwe. 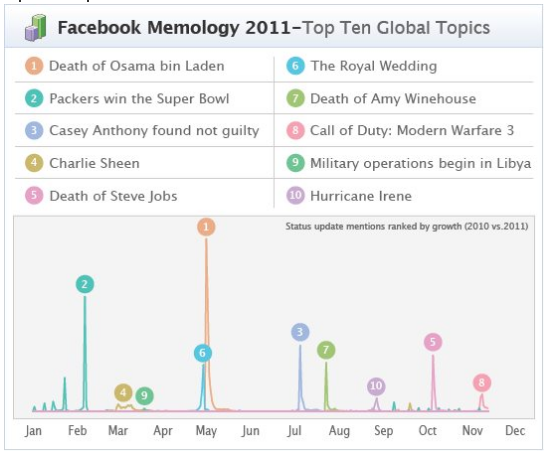 Meanwhile over at Facebook their "Memology" (a terrible piece of IT jargon if ever there was one) echoes many of the Twitter findings. The Royal Wedding featured highly as did the deaths of bin Laden, Steve Jobs and Amy Winehouse. There was some regional variation with the UK Riots coming in at #2 in the UK and two abbreviations (lms & tbh) ranking #1 & #2 in the USA. The Aussies seemed to be more fixated on 'planking' which was their #1 while the French followed the seemingly sordid goings on of Dominic Strauss Khan with great gusto. 'Affaire DSK' was their top status trend. Finally, Mashable reports that Twitter topped the list of most-buzzed about social networks this year, replacing 2010′s most-buzzed network, YouTube. 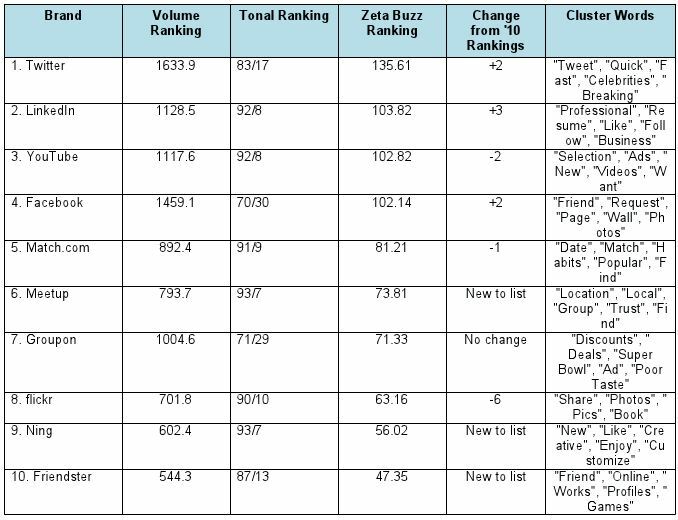 "The annual rankings by digital marketing agency Zeta Interactive measure volume (number of mentions in more than 200 million blogs, social media outlets and online posts) and tone (comparing positive and negative buzz). 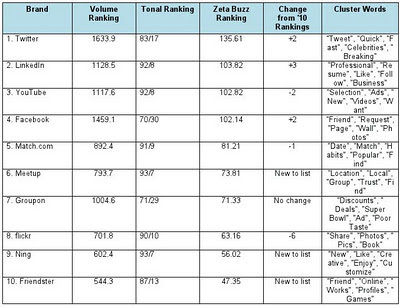 The Zeta Buzz score is calculated by the volume ranking multiplied by the percent positive ranking divided by 10, using data pulled since January 2011."